Soak seeds in water over night, drain and rinse before use. Reserve a few un-soaked seeds to toast, they will add a nutty flavor. Toss the vegetables together with seed mix, salt and herbs. 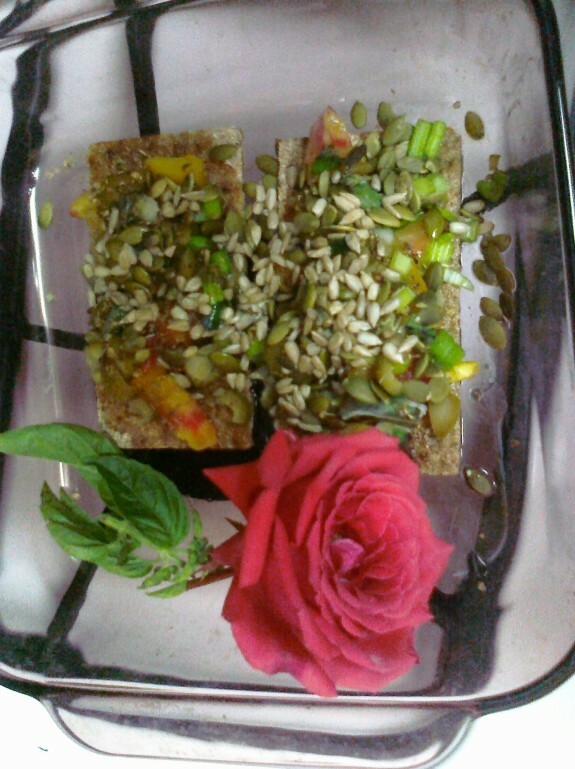 Arrange the vegetables on wholemeal rye crackers in a shallow pan. You may choose to use leaves of romaine lettuce or endive instead. Set in a pre-heated oven (350°F / 170°C) for 10 minutes. Drizzle with oil. Enjoy. When you are allowed to use oil after the first 2 weeks of phase 2, sprinkle with 1 TBSP flax seed oil or extra virgin olive oil.